We’d love your help. 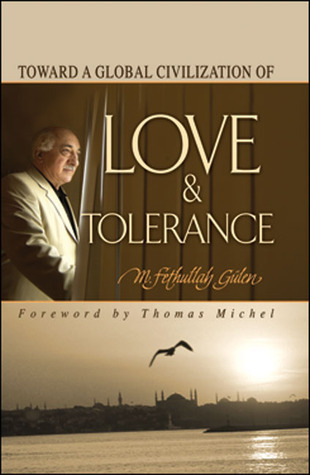 Let us know what’s wrong with this preview of Toward a Global Civilization of Love and Tolerance by M. Fethullah Gülen. Using a basis of theoretical and cultural dynamics, this study explores dialogue, tolerance, different religions, cultures, and civilizations. This book has a double purpose. On the one hand, it is a call to Muslims to a greater awareness that Islam teaches the need for dialogue and that Muslims are called to be agents and witnesses to God's universal mercy. On the other ha Using a basis of theoretical and cultural dynamics, this study explores dialogue, tolerance, different religions, cultures, and civilizations. To ask other readers questions about Toward a Global Civilization of Love and Tolerance, please sign up. Excellent read. Lots of grammatical errors probably due to poor translation/editing/publishing. Beautiful! I was given this book by a Turkish man who told me that Fethullah Gülen had changed his life and made him a better person and less angry at the world. There may be many others like him who were thus inspired by Gülen. To his followers, Gülen is an inspiration for peace, tolerance and interfaith dialogue. However, I also know that Gülen is a controversial figure, who has been declared a terrorist by the Turkish President Erdoğan, has been living in exile in the United States, and at least one jou I was given this book by a Turkish man who told me that Fethullah Gülen had changed his life and made him a better person and less angry at the world. There may be many others like him who were thus inspired by Gülen. To his followers, Gülen is an inspiration for peace, tolerance and interfaith dialogue. However, I also know that Gülen is a controversial figure, who has been declared a terrorist by the Turkish President Erdoğan, has been living in exile in the United States, and at least one journalist (Ahmet Şık) sits in prison for writing a book about him and his network of schools and other organizations that are directly or indirectly connected with him and "the Gülen Movement". I read this book hoping to find out more, but his schools are discussed very briefly. I might recommend this book to a Muslim friend, as many of the messages are positive and appeal to a Muslim audience. He extols the virtues of Islam as a religion of peace and tolerance that can improve people's lives and society on the whole. I have learned more about Islam and Sufism from this book and I became more convinced of a beneficent and cooperative interpretation of Islam that many if not most Muslims adhere to. However, it seems according to Gülen that Muslims past and present are beyond criticism or else they are not Muslims. It is one thing to argue that terrorists can never be true Muslims (and true Muslims can never be terrorists), but it is still problematic to argue that Muslims have only fought war defensively and honorably, and that the problem with the modern days is that Islamic states have not been realized and people have not returned enough to Muslim principles. His book has a strong and repeated denunciation of terrorism, with some fair insight of its causes but also with dubious proposals for solutions (the world must return to religion and Islamic principles of peace and tolerance). To be fair, I shouldn't have expected otherwise from a Muslim cleric. The other year, the exiled author M. Fethullah Gülen shot into the headlines due to Erdoğan's allegations that Gülen was the mastermind behind the failed Turkish coup. So, I figured, it would behoove me to get a glimpse into Gülen's publications to see what kind of a figure he is. Final analysis: "Harmless hippie." He'd be a safe (though annoying) guy to have as a next-door neighbor, I should think. The book contains (extremely poorly edited) articles and speeches ranging from 1980 to 2004, and The other year, the exiled author M. Fethullah Gülen shot into the headlines due to Erdoğan's allegations that Gülen was the mastermind behind the failed Turkish coup. So, I figured, it would behoove me to get a glimpse into Gülen's publications to see what kind of a figure he is. Final analysis: "Harmless hippie." He'd be a safe (though annoying) guy to have as a next-door neighbor, I should think. The book contains (extremely poorly edited) articles and speeches ranging from 1980 to 2004, and he spends a lot of time lauding a (hypothetical?) group he calls "people of heart" or "devotees of love and affection," described in perfectly idealized terms. He insists that the heart of true faith is love for God (where have I heard that before, I wonder?). For him, "Islam is a religion of security, safety, and peace," which principles "permeate the lives of Muslims." Islam is "a religion made up entirely of forgiveness and tolerance," he says. As a Sufi, his focus is on jihad primarily as inner struggle or social betterment, and he firmly denounces terrorism in all its forms: "Just as Islam is not a religion of terrorism, any Muslim who correctly understands Islam cannot be or become a terrorist. ... Muslims are the devotees of love and affection, people who shun all acts of terrorism and who have purged their bodies of all manner of hate and hostility." Gülen is a critic of the leaders of Muslim-majority countries, saying they've surrendered to fundamentalist and ignorance, and that Muslim-majority countries are dominated by "a Muslim culture..., rather than Islamic culture." He blames the rise of terrorism, and really any evil in the world, on a failure of education - hence his network of schools. This is a collection of thoughts and sermons by spiritual leader, M. Fethullah Gullen. He has a huge following! There is a lot of conversation fodder in this book, because he discusses many major themes: forgiveness, how to be a better (ideal!) person, what the world would be like if everyone lived in accordance with God's Will. This book has a loose narrative and some of the writing is rambling.Some members of our group found it hard to follow. Turkish author, educator, and Muslim scholar living in self-imposed exile in Pennsylvania, USA. He has been described in the English-language media as an imam "who promotes a tolerant Islam which emphasises altruism, hard work and education" and as "one of the world's most important Muslim figures." He is the founder of the Gülen movement (known as Hizmet meaning service in Turkish), and the inspi Turkish author, educator, and Muslim scholar living in self-imposed exile in Pennsylvania, USA. He has been described in the English-language media as an imam "who promotes a tolerant Islam which emphasises altruism, hard work and education" and as "one of the world's most important Muslim figures." He is the founder of the Gülen movement (known as Hizmet meaning service in Turkish), and the inspiration figure for its largest organization, the Alliance for Shared Values. In his sermons, Gülen has constantly emphasized the importance of education and interfaith tolerance and dialogue. Gülen's followers have built over 1,000 schools around the world and are engaging in interreligious and intercultural social activities. Gülen does not advocate a new theology but refers to classical authorities of theology, taking up their line of argument. His understanding of Islam tends to be moderate and mainstream. Gülen is inspired from Said Nursi's teachings and modernizes them. His teachings differ in emphasis from those of other mainstream Islamic scholars in two respects, both based on his interpretations of particular verses of the Quran. He teaches that the Muslim community has a duty of service (Turkish: hizmet) to the "common good" of the community and the nation and to Muslims and non-Muslims all over the world and that the Muslim community is obliged to conduct dialogue with not just the "People of the Book" (Jews and Christians), and people of other religions, but also with agnostics and atheists.